This summer, the star returns to Massachusetts for some much-needed R & R. Of course, that includes keeping things humming at the Marshfield General Store. This is the day for which New Englanders endure their winters. Not the kind of day. The day. It’s June 30th – a Thursday without humidity, the temperature parked in the mid-70s, the heavens a rich and shimmering blue. Puffy white clouds out of a Japanese anime chuckle obligingly in the sky. In fact, it’s the perfect day for a movie star to go on vacation. A studio production designer couldn’t have ordered it up better. Maybe that’s why the 48-year-old Carell bought the corner grocery. Taking up half of a low-slung 1853 wood-frame building – the other half houses the Post Office – the Marshfield Hills General Store came up for sale in 2008, and locals feared the business might close, eliminating a vital community gathering place. During a visit to Los Angeles, Nancy’s sister, Marshfield resident Tish Vivado, mentioned that the business was available, and in the months that followed, Carell flew out, closed the deal, and installed his sister-in-law as manager. It wasn’t for the profits, that’s for sure. Tucked away off a country road that eventually winds its way toward Scituate, the store feels like the last remaining proof of your childhood summers. You can buy balsa wood airplanes here – the kind with the rubber band-driven propeller that always gives you a wicked snap on the fingers. A rack of penny candy jars takes up one corner, leading one local to call the peppery Vivado, 48, the “neighborhood crack dealer.” There’s coffee and trinkets and T-shirts (including an Office one hanging toward the back), and there are just enough groceries to tide you over in a pinch. Still, the warm vibe of the place emanates from the wax lips and pop guns, the Silly Putty, and the basket of rubber snakes. They sell gimp here. Not “lanyard.” Gimp. “It’s such a bad investment,” groans Carell as he surveys the bustling morning scene this perfect end-of-June day. He couldn’t be happier. After seven fruitful but hectic years, he has stepped away from NBC’s The Office, on which he played Dunder Mifflin’s toweringly clueless boss Michael Scott. Less than a week ago, Carell departed the LA set of his current production, a semi-apocalyptic road-movie romance called Seeking a Friend for the End of the World, in which he stars opposite Keira Knightley. True, before July is out, he’ll be in New York, embarking on the press tour for his latest release – Crazy, Stupid, Love. – in which he gets dumped by wife Julianne Moore and receives stud-lifestyle coaching from Ryan Gosling. But right now, here is what he has to do: nothing. Actually, he has to spend the next couple of hours talking to a reporter who’s feeling guilty about encroaching on another man’s downtime. The subject is ostensibly Crazy, Stupid, Love., but the air’s too pure and the sun’s too warming for crass commerce. Let’s just say the star is proud of the movie (it’s his first as a producer), I enjoyed it, and you should probably go see it when it opens July 29. OK? 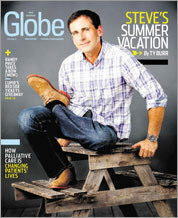 OK. Now let’s move on to more important topics, like the worst teenage summer job Steve Carell ever had. Was it his stint working at the Ramada hotel in Woburn? Alphonse’s Powder Mill restaurant in Maynard? How can you be terrible at produce? A normal, mildly obsessive Massachusetts upbringing, in other words, and its privileges were hard-won. Carell’s parents, Edwin, an electrical engineer, and Harriet, a psychiatric nurse, worked to send their sons to private schools, and Steve traveled each day to Concord, first to the Fenn School, then to Middlesex School. By the time he graduated from Ohio’s Denison University in 1984, he was all set – to become a lawyer. He got a job delivering mail in Littleton for around six months while he saved up for a move to Chicago, where, after waiting tables for three years, he joined the touring company of the fabled Second City comedy troupe. There he met his future wife, as well as a colleague named Stephen Colbert, and embarked on a journey that would take him through countless failed TV series, a foothold on The Daily Show in 1999, and, in 2005, the double-whammy breakthrough with The Office on TV and The 40-Year-Old Virgin in theaters. And if they had told him, Steve, honey, the acting thing is just too risky? 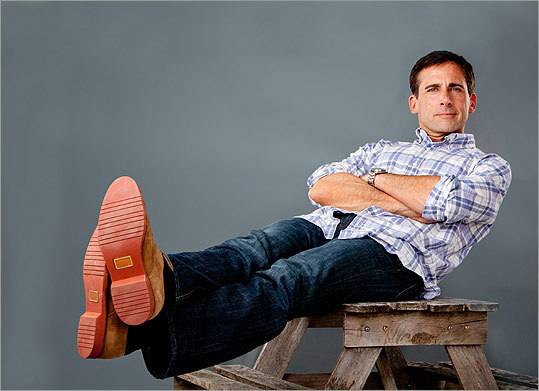 Here's the thing you have to realize about Carell: He’s not funny in person. Rather, he doesn’t try to be funny. Unlike a lot of comedians, famous or otherwise, he doesn’t seem to care about being “on.” In fact, right now he’s putting a lot of energy into being off. Carell realizes this, and he’s a little self-conscious about it. “Is this the driest interview you’ve ever gotten?” he asks. (Not by a long shot.) What he lacks in manic invention, though, he more than makes up for in droll observation. Carell is delightful to spend time with because he finds humor everywhere and in everything, and it constantly cracks him up. When he’s working, he can be funny enough to make your teeth hurt, but when he’s not on the job, things make him laugh rather than the other way around. His long-ago postal route in Littleton has been on Carell’s mind of late, too. He genuinely respected the people who worked alongside him, and he came to appreciate the way mail carriers can knit a community together in an invisible web. He put his memories into a TV pilot that he pitched to NBC, and while it didn’t get picked up, the idea’s still cooking on his back burner. “I might make a little independent film,” he says. “I think it would be a comedy, a smaller, more subdued kind of thing. About a kid who really doesn’t know where to go with his life and ends up delivering mail but because of that learns a lot about himself and what he does and doesn’t want to do.” Write what you know, they say. The morning's turning hot. Carell fishes out another bottle of water from the store’s cooler and lets out an amused whinny. “You know what’s so funny? For the first year, I paid for everything. And then I realized I was buying it twice.” Then he gets serious again, talking about his dislike of mean-spirited comedy – how that hung him up during his early Daily Show assignments until he hit on the tactic of making himself more ridiculous than his subjects. And he talks about his approach to creating comic characters that ring true. This leads to a paradox. This makes sense with some of Carell’s more fully fleshed creations: the 40-year-old virgin, for instance, or his heartbreakingly forlorn, suicidal, gay Proust scholar in Little Miss Sunshine. But what about a brilliant doodle like Brick Tamland, the idiot TV weatherman in 2004’s Anchorman: The Legend of Ron Burgundy? Does Brick know he’s in a movie? Just mentioning the name sends Carell into happy convulsions. “Brick?” he wheezes. “Brick doesn’t even know he’s a weatherman.” This confirms a suspicion some of us have had that it’s impossible for anyone to even think about Brick Tamland without dissolving into giggles, both at the character’s mythic stupidity and Carell’s evident joy in playing him. That this turns out to be true for the actor himself only makes it a better joke, as if Brick were just out there waiting to be found and Carell got there first. “That was the most fun I’ve ever had,” he says about the film’s production. “I laughed until I cried every day for seven weeks. I’ve never been around funnier people more consistently, and it was so stupid. What I loved about Anchorman was its complete lack of sentiment. There was no heart at all to that movie, and unapologetically. I wish we could do a sequel. I would do that in a second.” In fact, he says, Will Ferrell and his partner Adam McKay have pitched a sequel to Paramount, but the studio’s not interested. At the suggestion of getting a write-in campaign going in these pages, Carell perks up. “You know what? Will and Adam would love that.” The ball’s in your court, America. Which, in the real world, is hard to do. Especially for a Hollywood workaholic. Ty Burr is a film critic for the Globe. E-mail him at tburr@globe.com.